Applications at about 80% of schools are down, by a little or by a lot, meaning it looks likely that admissions offices are compensating by opening the gates a little wider. Of 49 schools that made their acceptance rate and related data available, 38 saw their application volume drop between 2017 and 2018, by an average of nearly 200 applications; included in the roster of schools with declines are nine of the top 10 schools. Only 10 schools saw app volume go up, by an average of just 68 apps. Acceptance rates seemed to respond, going up at 34 schools, including eight of the top 10 schools, while dropping at only 11 others. Among the schools that saw increases were Stanford, which again has the lowest acceptance rate at 6.3%. Serious MBA applicants should consider ‘acceptance rate’ when crafting their target list of schools. 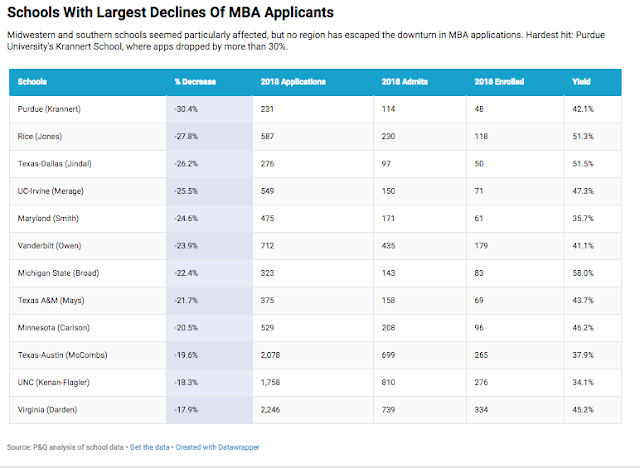 This is a proxy for the selectivity, prestige, and market demand of a given MBA program. A relatively low 6.3% acceptance rate at Stanford should not discourage an applicant whose GPA, GMAT, and resume are above the class average. Likewise, a relatively high 30% acceptance rate at Cornell Johnson should not encourage an applicant whose GPA, GMAT, and resume are clearly weaker than that school’s class average. In the top 10, only Dartmouth College’s Tuck School of Business saw an increase — of just 11 applications. In fact, only four schools in the top 50 saw double-digit rises in application volume between 2017 and 2018, led by Ohio State Fisher’s 32.4% increase from 444 to 588. Of the four, it is notable that three are public schools. Perhaps the most interesting case is at Arizona State, where a seesaw continues: Two years ago, the school saw a 161.6% jump in apps following its decision to offer all admits a full two-year scholarship; the next year apps snapped back with a 45.3% drop. This year, however, the Carey School is back up by more than 20%, the second-biggest rise of any top-50 school. Of the 34 schools with increases in their acceptance rates, 25 saw them go up by 2 percentage points or more; seven saw double-digit increases, including an 18-point jump at Vanderbilt University’s Owen Graduate School of Management, to 61% from 43%. Hardest hit: Purdue University’s Krannert School of Management, where apps dropped by more than 30%, from 332 in 2017 to 231 last fall. Going back to 2016, when it had 453 applications, Krannert’s application volume has fallen by 49%. 393 at UNC’s Kenan-Flagler Business School.